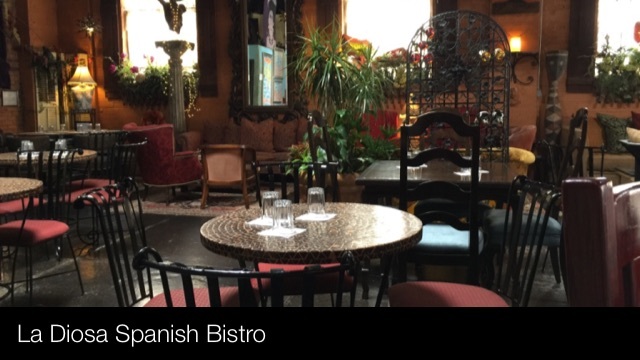 The tortilla española is a fan favorite at La Diosa Spanish Bistro. LUBBOCK, Tex.—With over 1,000 eateries within the Lubbock city limits, there is always an abundance of good food to choose from. The quandary then becomes what type of experience do I want? After speaking with a number of Lubbock restaurant owners, I found starting such a business isn’t always about the money. 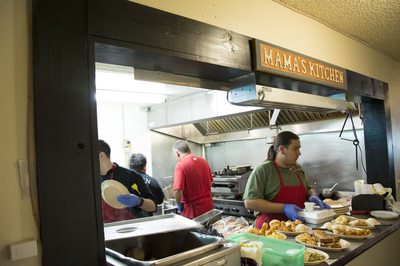 It’s about purpose, service and of course good food. It’s no secret that I’m a big guy. To look at me, you would not expect me to be a persnickety eater. Whatever I sit down to needs to appeal in concert to my eyes, nose and taste buds. The atmosphere needs to be calming and or inviting. Finally, once a meal is served I, have three rules. (1) Don’t stare at me or my food. (2) Don’t ask me about my food. (3) Matter of fact, don’t talk to me at all until my meal is masticated and digested. I broke all three on a recent trip to Lubbock. Cast Iron Grill patrons place their meal order. Many patrons know the Cast Iron Grill for the boots, pies and chicken fries. Owner Teresa Stephens says the hometown restaurant with pretty girls in boots has a divine mandate. As fate would have it, another diner in the same location had closed and was up for grabs. A family member first offered the restaurant as a co-venture to Stephens’ husband. Already too busy with his automotive dealership, he politely declined. Teresa thought maybe this was the opportunity she had been waiting for. Four weeks later, with a $13,000 investment from her husband, the 55 seat diner was open for business. The Cast Iron Grill’s menu has a wealth of country homestyle food for modest prices. 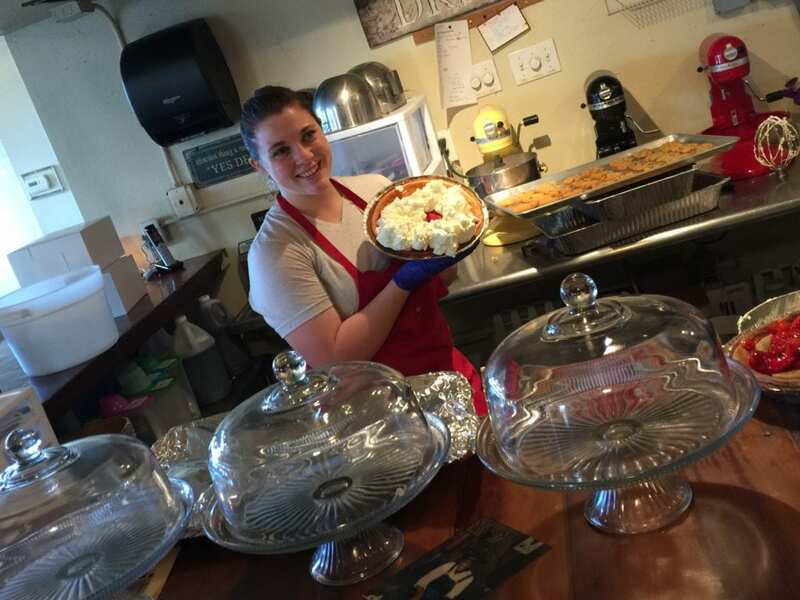 Pies are their specialty at Cast Iron Grill. Regular customers say if you don’t get there by Noon these sweet treats are gone. One thing the Cast Iron Grill has become famous for is their assortment of pies. A novice baker at the time, Stephens’ first inclination was to never serve the sugary staple in her diner. As time passed, Stephens perfected her culinary craft and demand for her pies grew like yeast. During the 2015 Christmas season, Cast Iron Grill sold more than 700 pies. Personal Note: I’m not a pie person; but I found something on her menu that I thought was even better than the pie I never put my fork to… a knockout brownie. After being stuffed by a deceptively light vegetable omelet and wheat toast, I decided to get my dessert to go. My very helpful server recommended the Mississippi Mud Brownie. I consented and thought nothing more of it. Later that night I was in chocolate heaven. In my experience, any baked chocolate concoction is always too dry, too sweet, not sweet enough or falling apart. There’s just no pleasing me. Until now. Even in a standard styrofoam container, the generous cut of brownie drenched in marshmallow, fudge, a light garnish of coconut shavings and pecans was more decadent than one would expect at some four star resorts. Matched with a steaming cup of decaf and the 500 thread count sheets at the Overton Hotel, made for very sweet dreams. Opened in 2007, Cast Iron Grill now employees 25 cooks and servers.. 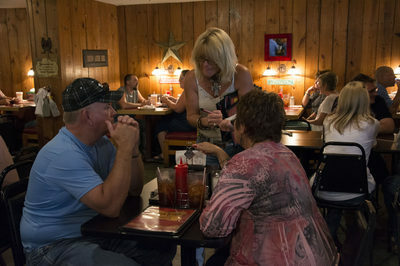 When Stephens and her brother-in-law opened the doors of the Cast Iron Grill on September 11, 2007, it was in a very different part of town than her current 167 seat location. Some would call the area undesirable. She called it home. There were a number of homeless individuals outside the building. At that time, it was known as ‘tent city’. Looking out over of the landscape of urban blight seven years ago, Teresa knew that her year long prayer for divine purpose had been answered. Her job was to feed body and soul. She met Father Barry Ferguson of St. Benedict Chapel. In 2007, St. Benedict began feeding the homeless on a consistent basis once a week. 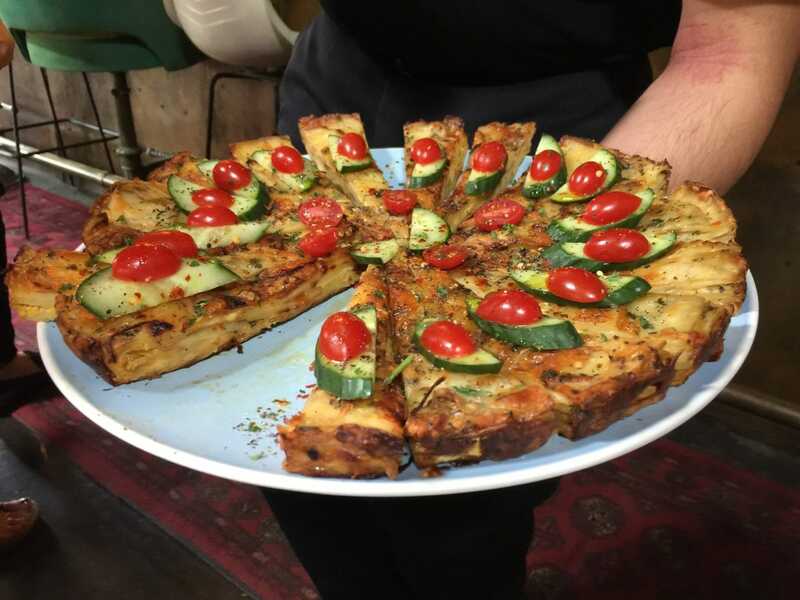 They partnered and began to feed about 30 men on a weekly basis. These aren’t your run of the mill dinners for the transient. Now the ministry is numbering about 160 meals each day. There are no paper plates, no buffet lines or hermetically sealed TV dinners. Diners are welcomed to the facility and seated and served. Everyone is welcome at St Benedict on any feeding night. “Everyone just wants to have dinner with friends,” Stephens said. Meals are not limited to the homeless. There is no sign in sheet. Anyone having financial difficulties who desires a good meal without the fuss is welcome. “They [working poor] can barely pay their rent and cover their utilities, but they can’t feed their families,” she explained. Meals have increased from just Mondays to every day of the week at 5 p.m. Six other Lubbock churches have now sponsored days to serve the community. “The Lord brought me eight additional people from other congregations to help serve.” Stephens beamed even more when talking about her nonprofit work than when talking about her thriving restaurant that employs 25 people. “We are the only Lubbock business to serve there, so the other congregations just call us St. Cast Iron,” she laughed. 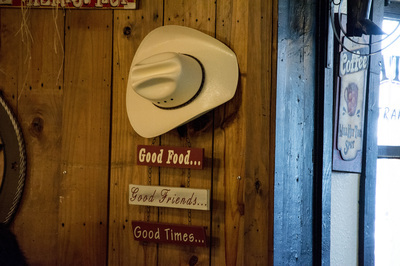 Cast Iron Grill isn’t the only Lubbock locale with great food, atmosphere and history. Below are some other stops I would recommend.